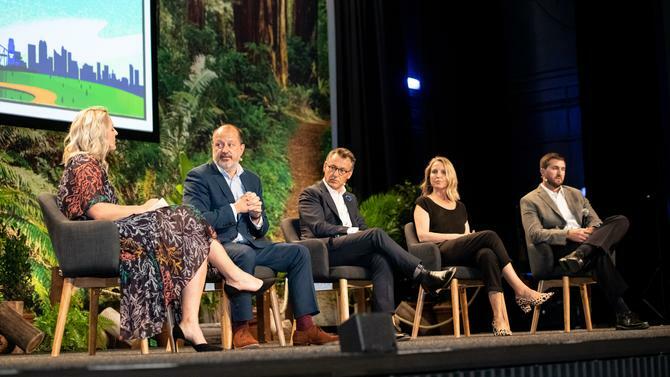 Speaking at this week’s Salesforce Connections to You conference in Sydney, PwC chief creative officer and well-known agency personality, Russel Howcroft, harkened back to David Ogilvy and 1950s advertising to teach the audience a few lessons on what the future of marketing should look like. In recognising consumers are more powerful than ever, for example, Howcroft said it’s critical to “respect the consumer and communicate in a way that they reward you with a sale”. Howcroft also agreed the vital foundation for how brands operate is a sense of purpose and value. “The need for us to go back to purpose and values is so key. It’s so easy to say, but it is everything,” he said. The problem is purpose and value have become “stickers on the box”, Howcroft said. “The language seemed to make sense, and we put a poster up in the staff room and thought it was enough. That was where I was over a long period of time, until we’ve been confronted with what’s going on in brands and businesses and the world right here, right now. How to then capture brand tone of voice and ensure its continuity right through the funnel to one-to-one interaction is the challenge everyone faces now, Howcroft said. Salesforce APAC senior vice-president, Lee Hawksley, saw this tone of voice as brand purpose and value. That requires both employee and executive buy-in. “To quote Simon Sinek: No customer ever loved a company that its employees didn’t love first,” he said. “Usually employees love companies founded in great values, have a strong culture and offer them a sense of purpose. That really creates the tone of voice, from marketing service agent to consultant. It all starts with culture and pulling together to get that consistency. For Hawksley, the key is understanding people want whole-of-brand experiences. “It’s not just a marketing experience. What’s the experience when I need service, or walk into a store? These are vitally important touchpoints and create these moments matter marketers are always talking about. Merkle APAC managing director for A/NZ and EVP customer experience and marketing technology solutions, Ted Stites, also saw huge risk in not fulfilling a brand’s purpose. While there’s a great opportunity to tell a better and more entertaining story, Stites also advised knowing the moments in time when a customer doesn’t want that story. And as Google Marketing Platform agency lead, Megan Thomas, warned, too many people still think data-driven marketing just means putting technology in and switching it on.